Listová pera pro zúženou přední nápravu o 5 cm 2 sady. Front axle torsion springs 2 sets narrowed. 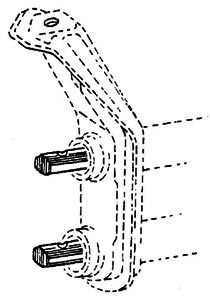 When the beetles t / m 7/1965, these are solid torsion bars while after 8/1965 has been amended to multiple torsion strips, as a bundle together the torsion forms. Over time they can go through pockets where replacement is the only good solution. These torsion springs are available for both the original and reduced front axle for the 5 cm narrowed front axle. All the torsion springs as a set for both the upper and the lower torque tube. Replace always together and never apart.